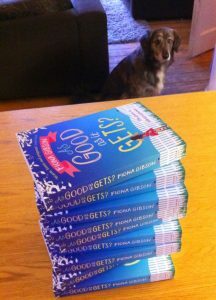 My new novel, As Good as It Gets?, is out in paperback today. Publication Day is a funny old thing: not quite what I’d anticipated when my first novel was published in 2003. I suppose I’d expected something rather like Christmas – ie, a whole load of fuss and excitement and booze. It was exciting – I remember an enormous bouquet arriving from my publisher, and waking up thinking, ‘My book is OUT! !’ – but not quite in the way I’d expected. In fact, what I really love about Publication Day is the way it boosts me to get on with making the next one. It’s due to my editor by June, and will be out early next year. It’s a rolling process, which I happen to love: it feels fast-moving and exciting and you can’t be too precious about anything. I used to sweat for three days over a single paragraph but these days, if it’s not flowing reasonably easily, I move on to a part that I’m eager to write, and come back to the tricky bit later. I think that’s brilliant. It sort of shrinks the project down to size, making it seem instantly less scary and intimidating. Suddenly, it seems doable. It feels like the difference between being given a vast stately home garden to knock into shape, or a little window box of chives. Small children may be a handful but at least you know where they are. Even when they’re toddling, you can move faster than they can. As they want to be with you pretty much all of the time, you’re never hit with that wave of horror (‘Oh my God, where is he?’ Answer: on you). Then… everything changes and there comes a point at which they don’t want us around at all. They want to go out without us while we stay at home, doing our tedious grown-up stuff. 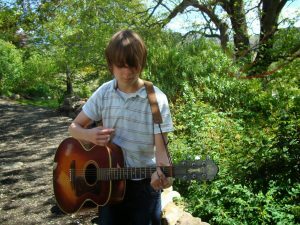 My sons were nine when this happened: a bit young to be playing out alone, you might think, but we live in a sleepy country town with few obvious hazards. Apart from one falling-off-a-bike incident (broken arm) and being whacked in the face with a hockey stick (smashed tooth), all the numerous dashes to A&E have been caused by incidents at home. Yet we’re still scared of the great outdoors when our kids are small. It doesn’t make any sense. If you consider the hazards in your average home – oven, iron, fireplace, booze, all of which can be horribly dangerous if handled without due care – then playing in the park is as close to a haven of safety as you can possibly get. In my childhood West Yorkshire village I played out with no parent hovering nearby from the age of four. Friends and I would force entry into a derelict textile mill and charge about on the rotting wooden floors. There was a metal trough – it can’t have been more than a foot wide – which spanned a gorge and was ideal for running across. We swam in a dam and cycled for miles and nothing terrible happened. Okay, a man flashed at me once (old-style, with raincoat, from a hillside). ‘I saw the front of a man!’ I yelled, pelting into my house. Mum just gave me a curious look and carried on stirring the pot on the stove. I think she suspected I was making it up. When the teenage years hit, I wanted to be as far away from my parents as humanly possible. My own kids are the same. ‘They’re allergic to us,’ a friend complained, when we were discussing our kids’ unwillingness to come along on family days out – and of course it’s hurtful at first. Normal, though. And let’s be realistic: yes, it would be quite sweet to go Edinburgh Zoo with my almost eighteen-year old twin sons. But I’d be unable to shake off the suspicion that they were regarding the trip as ironic, in a sort of, ‘Can’t wait to Tweet about this – my day at the zoo with Mum and Dad! Haha!’ kind of way. And they’d force us to stand there smiling in front of some baboons and take our picture and all their friends would laugh at it. Anyway the baboon scenario is hypothetical because the only way I’ll persuade any children of mine to come to the zoo with me is if I adopt some younger ones. And since my offspring nearly peed themselves at my ‘massive’ forehead – they’d never seen my fringe pulled back before – I’ve decided I’ve had quite enough cheek off kids. So off they go, every weekend – to Glasgow and Edinburgh, our nearest cities, both an hour’s journey away. This started when they were 15. I fretted madly at first: was this too young to be in a big, scary city with a bunch of similarly giddy adolescents? Then I asked myself: what was I scared of exactly? What could possibly happen to them in Top Man? As the years crept on, my sons started going on ‘camp-outs’, a favoured teenage activity in these rural parts. The idea is, a bunch of friends head off into the wilds for the night with food, guitars, a tent and sleeping bags and return, looking like corpses that have been dragged through dung, at around 9.30 am next day. I’m not foolish enough to believe that they lounge around practising the knot-work skills they learnt at Scouts. And of course I was iffy about it at first. But at 16 they needed their space. Last year, at 17, my boys announced that they were going on a week’s holiday to Paris together. I felt no more than a small tingle of nerves as they set off for their flight. Next it was our turn. My husband Jimmy and I went to the South of France for a week, leaving our boys home alone (our youngest child had been taken on holiday by a friend’s family). We were aware that two teenagers together are possibly capable of getting up to more hi-jinx than a singleton left alone. But then, a singleton wouldn’t be alone for long: word would get out and friends would converge and it wouldn’t be your house any more, it would be the Chelsea Hotel. On our return, our sons vowed that they hadn’t had a party. But there was a ragged crack in the bathroom door and I kept finding the odd New Look stiletto lying about. It was only a ‘gathering’, I was told. Worrying. But not half as scary as that first time they went to the park. And give tips for the best acne moisturizer to use. Well, yes, you get the picture. But it happens to be true. We’re all prone to chapped lips and cracked hands, after all. It also happens to be the time of year when the ravaged bank account means we’re hardly in the market for a luxury moisturiser at £45 a pop. But that doesn’t matter because, having spent every winter since my early thirties literally slathering myself in every cream/oil imaginable, I’ve realised that the very cheapest products do a remarkably decent job. Personally I despise that lizardy feeling, when skin goes all reptilian from around October onwards. And I’ll fight it to the death no matter how broke I am. First up, I love a good body scrub in the shower. In The Thrift Book (Penguin), author India Knight recommends making a paste with olive oil and sugar (presumably granulated – I can’t imagine icing sugar having much effect) and rubbing yourself all over with that. I’ve tried this and it absolutely works. It also leaves the shower perilously slippy, so do sluice it out or at least warn the person getting in after you – unless they’ve recently annoyed you and you want to get them back. Back in my teen magazine days I’d often recommend rubbing vigorously at your elbows with the inside of a scooped-out avocado skin. What was I on about? 16 year-old girls’ elbows aren’t scaly. They are peachy soft. Anyway, I should confess that I have never tried this in my life. Nor did I whip up face packs from mashed banana, fresh cream or oatmeal. I didn’t even see an avocado – apart from in pictures – until about 1986. But I’m a great believer in using an exfoliating product with some kind of skin-softening properties built in – especially on craggy areas like elbows, knees and feet. I always feel better after a good sanding down. The Espa range is fantastic, but possibly not for the broke days of January. Instead, my winter scrubs of choice come from Soap & Glory’s extensive range: Sugar Crush and Pulp Friction are favourites. The range is often on offer at 3 for 2 in Boots. Incidentally, while some friends find S&G’s packaging too tacky and teenage for their liking, everything I’ve tried works brilliantly and I find their whole quirky thing immensely cheering on dark days. I like the fruity and burnt-sugary scents of their products, and I’d rather have a heap of their jaunty pink pots than one eye-wateringly expensive item from Space NK. Maybe I’m just the cheap and cheerful type. Equally pleasurable is the slathering on of some kind of lotion, post your scrubbing endeavours. Heck, it’s winter, we’re indoors a lot – so we might as well feel silky soft. I’m currently alternating between Dr Hauschka Bodyoilie Citroen Lemongrass (not super-cheap: was a Christmas present) and the super-rich Righteous Butter (another Soap & Glory treat). As for skincare, I’ve worked my way through enough ranges to come to the conclusion that it’s not about price, it’s about finding something that’s pleasant to use, leaves skin pleasingly soft and doesn’t cause a reaction. When my children were younger, and I could get away with presenting charity shop toys as new, I’d occasionally treat myself to something from Clarins or Clinique. Now, with school skiing trips and university looming, I’ve downscaled to Olay and Revlon moisturisers which do the job every bit as well. As for hand cream: hugely important if you’re out in all weathers, maybe walking the dog. Again I’ve tried dozens. King of them all is the mighty Hemp Hand Protector (Body Shop) which thrilled my kids a few years back due to its drug reference. Note: while hand cream is pretty essential, I don’t go with the thinking that you need specialist creams for your neck, feet or whatever other areas might be resembling crepe paper. A decent rich body lotion isn’t fussy about the parts it treats. So basically, while I’m not too pernickety these days – or especially brand loyal – I feel it’s important to treat ourselves during these wintry months when we don’t have a tan to help us along. I mean, no one might even see your feet for another 12 weeks, but it’s still a little depressing if they’re gnarly. At least, that’s what I tell myself when I head with my battered old credit card into Boots. 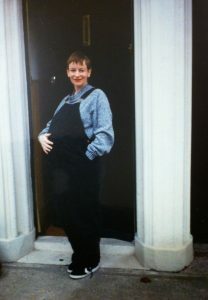 I was raking through some old photos for a magazine feature and came across this pic of me, very pregnant with Sam and Dex, in front of our last London home in Cyprus Street, Bethnal Green. I was so excited to be having twins. It’ll be a doddle, I thought: two babies, one pregnancy. Bargain! I also thought I’d be back in my beloved office within a matter of days, having hired a nice nanny to take care of the practical aspects. Me, I’d enjoy the fun stuff – tickling, cuddling, baking cookies and reading beautiful picture books. Here’s what I wish I’d known then. All the stuff you used to enjoy – films, books, drawing, playing an instrument – go out of the window for a while. I mean a long while – years, in fact. When they finally start creeping back into your life, you worry that you’ve forgotten what to do with them. For ages, I couldn’t concentrate on any film more challenging than The Breakfast Club, Pretty In Pink or St Elmo’s Fire. It was like being a teenager again – but with stretch marks and a fridge crammed with formula milk. But gradually things returned to normal – ie, occasionally I’d watch a film that didn’t star Molly Ringwald, sometimes even with subtitles. You will wear those dungarees to death. I scoffed when my husband Jimmy insisted on buying them for me in an army and navy store in Paris. But they are the very best thing for a pregnant lady and became virtually welded to my rapidly expanding body. You think you’ll work right up until the day before they are born, but you won’t. My consultant wouldn’t let me. So from six months onwards I lay around the house, spooning Ambrosia Creamed Rice straight to my mouth from the tin. I wish I’d known then to enjoy feeling faintly bored, as that was the last chance I had to be idle until eight years later, when our third child started school. Oh, and I never returned to my old job. I haven’t had a regular salary since 1997 and hear that the workplace has changed a lot since then – for instance, you’re not allowed booze in the office! How on earth do people get through the working day? Child-free friends will tell you about their glamorous nights out, or that they’ve just been to a spa and had their breasts exfoliated. You are allow to feel bitter – and even cry – over this. It does not make you a bad person. Your nanny plans will be swiftly forgotten. You’ll become a control freak who’d rather do it – even the messy, mundane stuff – yourself. People will assume your twins were IVF (when they’re not) and will challenge you on this delicate matter in the park. 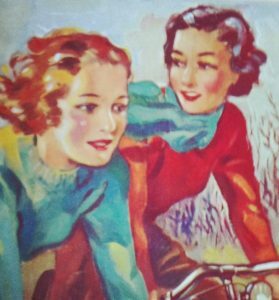 ‘They must be!’ one woman insisted, before adding, ‘but I suppose you did have quite a high chance of having them… as an older mother.’ People will say the most irksome things, and after a while they just wash over you (or make you laugh hysterically as you scamper home). You’ll become remarkably tolerant because all that matters is getting your children out in the fresh air, then safely ferried home again whilst avoiding dog poo. Going to the hairdressers becomes such a hassle that you’ll start having someone come round your house. She will chop at your hair in your bedroom while your babies crawl around, trying to eat it off the floor. It’s not relaxing, and no one brings you a nice coffee or a glossy magazine – but at least your fringe is out of your eyes. People will tell you what you’re doing wrong all the time. Ignore them. They know nothing. At least you know a bit. The toddler groups you thought would be hell are filled with like-minded women you’ll rely on for your sanity. Sure, the coffee is bad, as are the pink wafer biscuits – but you now anticipate these get-togethers more eagerly than Christmas. You will glance wistfully at pretty lingerie in department stores, before moving swiftly on. You’ll be in massive sensible knickers for quite a long time – possibly forever – and you will love them. That massive bump will go away, but not in a week. It doesn’t matter. No one cared about celeb mothers shedding the baby weight within minutes, because the whole celebrity obsession hadn’t really taken off back then. There was no sidebar of shame – there was the Internet, but no one knew what it was – and no one expected a raddled new mother to look radiant. You were allowed to be knackered with your hair sticking up. And you were allowed to wear your beloved dungarees well past childbirth, because they made look earthy as if you knew what motherhood was all about. And you soon become very adept at pretending you know what it’s all about. 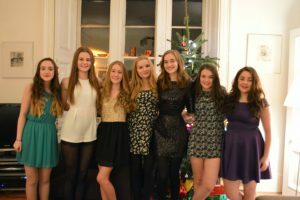 Last night my daughter Erin (centre) and her six friends descended on our house to get ready for the school Christmas dance. Remember the joy of getting ready? It was often the best part of the night. In fact sometimes I’d feel a slight twinge of disappointment when the time rolled around that we had to actually leave the house and go somewhere. Getting ready always happened with a friend, preferably at their place, as it was always more fun to be somewhere else. And it took so long! An hour at least, but more likely two or three – ie, approaching half of a normal working day. My life these days is generally about trying to achieve as much as possible in the shortest time. I can hardly remember how it felt to have virtually limitless time to spend on something so indulgent. Of course, it wasn’t really about applying make-up and tonging our hair. It was about being together, gossiping and sharing confidences and amidst clouds of loose powder and Elnett hairspray. There’s something particularly intimate about the process of transformation; few people see us ‘half done’, after all. I always love those old black and white photos of Hollywood stars captured in deep concentration in their dressing rooms. Our dressing rooms were our teenage bedrooms, plastered with Paul Weller posters and heady with Lulu perfume. My friend Karen’s duvet cover was made from the same fabric as her curtains, which struck me as particularly chic. No boys were around as we caked on Rimmel foundation, although we’d discuss them in forensic detail, of course. When my children were younger I often found we’d have our most relaxed and revealing conversations when I was driving them somewhere. There’s something about being engaged in another activity – crawling through traffic, applying mascara – that’s conducive to easy and honest discussions. Do I miss getting ready? Not especially, as it belongs to a time and a place that’s long gone. It would seem as crazy as filling empty Soda Stream bottles with illicit booze to slug on the way to a party, and I hardly ever pull that stunt these days. It belongs to an era of getting dressed in something low-key, then throwing a carrier bag containing the ‘real’ outfit out of my bedroom window (to be retrieved and changed into in a phone box en route to the disco). Getting ready these days takes about 15 minutes, even for a really posh do. I can hardly believe I’d once have spent ten times as long dolling myself up for a ropey old disco in a community hall. But they didn’t seem ropey back then. I vividly remember the clothes we wore, the songs we danced to, and the elaborate plots we came up with in order to start conversations with boys. I remember Karen and I hitching a lift – I’d keel over from a heart attack if my daughter did that – to a disco in a neighbouring town. So many things could go wrong with a night out. The boy you liked could get off with someone else, causing you to seek solace in too much Pernod and black. There were frequently fights in the loos and distraught friends to take care of. Worse still, that willing parent might have ignored instructions to wait around the corner, and parked right outside the venue for all to see. Putting your face on at a friend’s house never involved such horrors. The getting ready part could never disappoint. These days I’m the chauffeur and am used to tuning out as I transport a bunch of excitable teenagers home. I know better than to quiz them about how their evening was – because all they’re going to say is, ‘Fine.’ But maybe it was merely fine, and getting ready was still the best part of the night.